Official Release Date: September 30th. DVDs available for immediate shipping. This DVD pulls back the curtain and reveals what is going on in the mind of those who deny the obvious. It introduces you to a number of atheists who you will follow as they go where the evidence leads, find a roadblock, and enter into a place of honesty that is rarely seen on film. 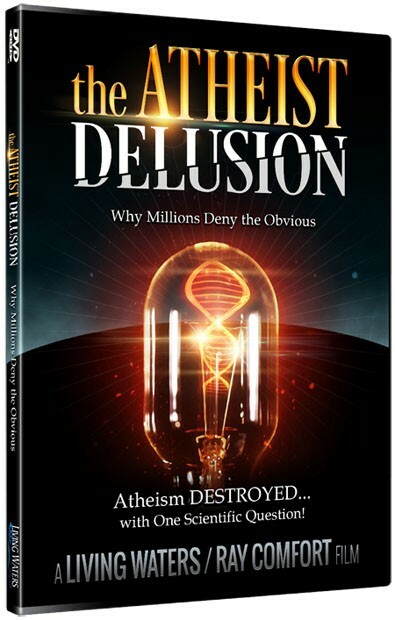 From Living Waters, creators of the award-winning TV program “The Way of the Master” and the hit movies “180” and “Evolution vs. God,” comes the powerful film “The Atheist Delusion.” Executive produced by TV co-host and best-selling author Ray Comfort (Hell’s Best Kept Secret, Scientific Facts in the Bible). Having to prove the existence of God to an atheist is like having to prove the existence of the sun, at noon on a clear day. Yet millions are embracing the foolishness of atheism. “The Atheist Delusion” pulls back the curtain and reveals what is going on in the mind of those who deny the obvious. It introduces you to a number of atheists who you will follow as they go where the evidence leads, find a roadblock, and enter into a place of honesty that is rarely seen on film.